The glowing purple elephants, who were doing a line dance on a stage decorated by someone who must have been in a full psychedelic trance, were the impetus for my firm declaration one day this summer that my kids would not have access to any screens for the following two weeks. As the sadly anthropomorphized pachyderms stepped in time to the music muzak, I could picture my kids’ brain cells drying up, one by one, into little balls of shame and misery. And so, the next day, the tablets did not make their way into our car along with the disproportionately large piles of stuff that tend to get thrown into cars before an extended trip with kids. Then the unexpected happened. We drove for over 4 hours without a single complaint about what to watch or who gets to watch what and with whom. Instead, we listened to music, singing through whole CDs. The kids looked out the window instead of down into their laps. We stopped to have a picnic lunch without needing to pause anything or charge batteries. It was a like unclenching a fist which you didn’t even realize had been tensed; the sense of calm and relaxation unfurled slowly and gloriously. And this continued in a similar vein for the whole two weeks we were there. I found myself so much more tranquil than usual, and I attribute that to not needing to break up fights over screen time or haggle with the kids for how much more time they could watch before turning the darn things off. Instead, we went to the library to check out books. We (okay, the royal We) went outside willingly. Okay, that might have had more to do with the presence of grass and trees and bugs (and bugs, did I mention bugs? )—things that are missing from our regular urban landscape. This worked partially because there was no choice. There were no screens to turn to during episodes of boredom, in order to be pelted with “animated bombardment,” to quote the indefatigable Mr. Rogers. There was also a lot less with which to bribe them to clean up, but somehow with more time on their hands, the kids were surprisingly capable of helping out. Here’s where you hypothetically listen to me describe coming home after two weeks and chucking the screens, then everybody dancing off into the sunset—and only doing educational and interesting activities in their spare time from now on. But that didn’t happen. 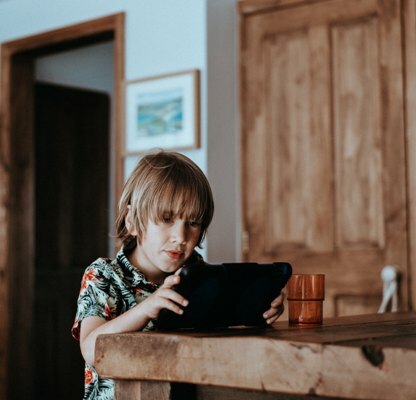 I can quote you statistics about the bad effect screen time has on kids...and I can also quote you statistics about the bad effect insanity has on mothers of young kids. And let’s not forget, kids work hard. Especially kids like mine who are in private schools which they love (thank You, G-d! ), but are out of the house from approximately 8 am until 5 pm, a.k.a. “too many hours”. So do my kids still watch kiddie shows occasionally, which are not Daniel Tiger? Yup. Do I sometimes wish we had no screens in our home? Absolutely. And now that I know we are capable of screen detachment, I see endless possibilities in our future long car drives and vacations (shh, don’t tell the kids). So I encourage you to give it a try. Your before-and-after may look different from mine, but rest assured, your kids can live—and even be happy—without watching mindless videos. They might even learn something from looking out the window. whose last name is totally phonetic, has enjoyed writing (and, endearingly, correcting people’s grammar/spelling mistakes) for years, but this was mostly superseded by the overwhelm of motherhood and living in a Big City. Rochel holds a Master’s degree in Marriage and Family Therapy and works in the mental health field. Originally from California and Baltimore, she currently lives in Brooklyn, NY with her wonderful family who sometimes enjoy her baking and sudden impulses to go out and enjoy nature. She has previously been published on Aish.com, and is currently working on a blog on travel and marriage.